It’s that time of year again where we adorn our home with lights, poinsettias, and various nods to Old St. Nick. We feel more giving than normal, but also secretly (and sometimes not so secretly) hope everyone else is in the giving mood too. While this is certainly a time for traditions, that doesn’t mean we have to be completely stuck in our old ways. If you’re looking to team your holiday spirit up with the modern world, then you’re likely looking for gadgets and gizmos that will make things more interesting. One of the major aspects we associate with this time of year is a pine tree all gussied up with lights, ornaments, and a star sitting atop it. Of course, we listen to music all year long, the only difference being a change in theme. 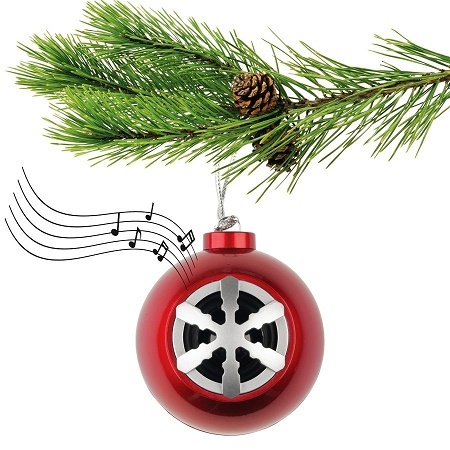 If you want to listen to some tunes to get you in the holiday spirit, then why not put a speaker on your tree and rock out to Jingle Bells? The Acoustic Research 3-Watt Portable Speaker looks like a ball-shaped ornament with a snowflake pattern that can connect with your Android, iPhone or iPad devices. Of course, if you don’t have a tree handy, you can make this your standalone decoration. This is rechargeable, and is said to give you “hours of play time”, though that will likely vary a bit from person to person. This will cost you around $18 for one speaker, and would be a great present for anyone who gets overly excited about Christmas.